I was flipping through the Charlotte Business Journal a few weeks ago this ad struck me. I stopped partly because it contrasted the busier, text-heavy ads, but also for its tagline. No one questions the spending power of the boomer generation and its impact on our economy. But so many advertising dollars are spent on the young, so I contacted Lee Stewart to learn more about his company’s unique positioning. “It’s easier for a boomer to understand a 25-year old than it is for a 25-year old to understand a boomer” he said. He reflected on the advertising heydey of the Madmen-era, and the cleverness of Volkwagen’s 60’s campaigns. 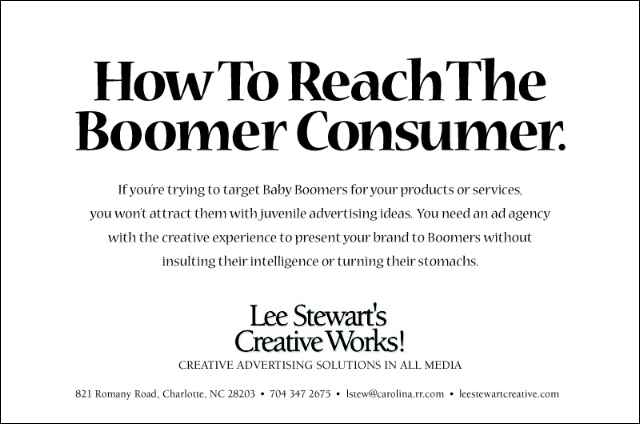 Stewart suggested that today’s ads are geared towards shock value and may insult the intelligence and value set of the Boomer market. Career accomplishments aside, I was equally impressed that Lee Stewart practices what he preaches. Contrary to instinct, a down market is when advertising sees greater penetration. Follow up ads in this series will run in July and September.